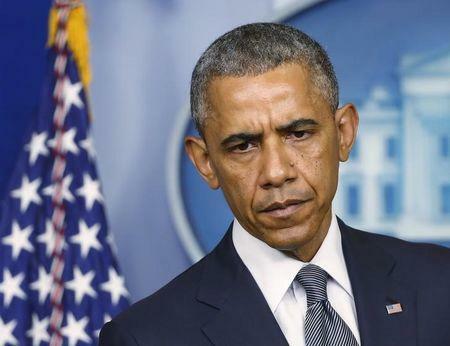 President Obama on Friday called the downing of Malaysia Airlines Flight 17 an “outrage of unspeakable proportions,” declared it a “wake-up call” for timid European leaders, and all but laid blame for the tragedy directly at the doorstep of Russian President Vladimir Putin. Obama’s blunt language, delivered in the White House briefing room from behind a lectern with the presidential seal, offered a stark contrast to his muddled public handling of the disaster a day earlier. As the news broke on Thursday, the White House signaled that the president had first learned about the world-shaking events from Putin at the tail end of a telephone call arranged at Moscow’s request. With grisly details coming in, Obama went ahead with a heavily partisan public schedule: A speech in Wilmington, Delaware, where he hit Republicans over infrastructure funding, followed by a brace of Democratic fundraisers in New York City. Obama had begun his speech in Delaware with just seven sentences on the attack, declaring that “it looks like it may be a terrible tragedy” — a jarring response to media reports that were already citing a death toll of nearly 300 people. He did not tie the catastrophe to Russia. Republicans have recently stepped up their regular criticisms of Obama’s handling of world affairs — a reflection of escalating chaos from Iraq to Libya, as well as Syria's widening civil war, China’s increasingly tense relations with its neighbors, and the collapse of the Middle East peace process. His natural caution in the face of crisis has fed GOP charges that he is too slow to act or give voice to American outrage. Come Friday, Obama revised his tone, shedding “may be a terrible tragedy” in favor of “outrage of unspeakable proportions,” personally confirmed that “a surface-to-air missile was fired, and that's what brought the jet down,” linked the attack directly back to pro-Moscow Ukrainian separatists, and implicated Russian President Vladimir Putin. Putin’s refusal to halt the flow of weapons and fighters into eastern Ukraine has emboldened the separatists and led them to snub talks with the government in Kiev, Obama charged. Putin “has the most control over that situation, and so far, at least, he has not exercised it,” the president said. Obama had a stern message about European leaders, who have resisted U.S. calls for strict economic sanctions on Russia for stirring up armed unrest in eastern Ukraine, fearful that Moscow could shut off westward flows of oil and natural gas. “This certainly will be a wake-up call for Europe and the world that there are consequences to an escalating conflict in eastern Ukraine, that it is not going to be localized, it is not going to be contained,” he said. And the world learned from the president that at least one American, Quinn Lucas Schansman, was among the victims. White House aides had emphasized on Thursday that the president had taken charge behind the scenes. They disclosed his telephone calls to leaders of Ukraine, the Netherlands and Malaysia. They highlighted that he had spoken to Secretary of State John Kerry by telephone and had later consulted CIA Director John Brennan, Principal Deputy Director of National Intelligence Stephanie O’Sullivan, White House chief of staff Denis McDonough, and deputy national security advisers Lisa Monaco and Ben Rhodes. It was not clear to what extent Obama, who came to office vowing to “reset” relations with Russia, would change his cautious strategy when it comes to Ukraine. The president has fended off calls from Republicans to upgrade that country’s weaponry and assist its fight against the Russian-backed separatists. One administration official, who requested anonymity, suggested that the airliner tragedy highlighted the need for extreme caution when considering whether to provide advanced weaponry to forces not accustomed to using it. Asked whether he would escalate the pressure on Moscow, Obama declared that “it's very important for us to make sure that we don't get out ahead of the facts” and noted that he had just announced fresh sanctions on Russian energy and financial firms on Wednesday. But Obama ruled out a greater role for the U.S. military. There’s no way for the president to avoid partisan criticism in the current political climate. But he might take some comfort from the experience of former President Ronald Reagan, the conservative icon who faced sharp words from fellow conservatives over his response to the Sept. 1, 1983, incident in which a Soviet fighter jet shot down a South Korean airliner with 269 people aboard — including a U.S. congressman — killing them all. Reagan called that attack an “act of barbarism” and referred to it as the “Korean airline massacre.” He ordered Soviet airline Aeroflot’s U.S. operations to be shut down a week after the incident. His personal diary for Sept. 4, 1983, suggests that he took seriously a Republican senator’s suggestion that the United States retaliate against undercover Soviet operators. He also complained about sniping from his right flank. "Short of going to war, what would they have us do?” he asked in a speech. "I know that some of our critics have sounded off that somehow we haven't exacted enough vengeance," Reagan said. "Well, vengeance isn't the name of the game in this." Reagan recorded his personal feelings in a September 17 diary entry. “Im really upset with George Will. He has become very bitter & personal in his attacks mainly because he doesn’t think Ive done or am doing enough about the Russians & the KAL007 Massacre,” he wrote, before giving Will what Reagan’s admirers in today’s Republican party might regard as the ultimate Reagan kiss-off.